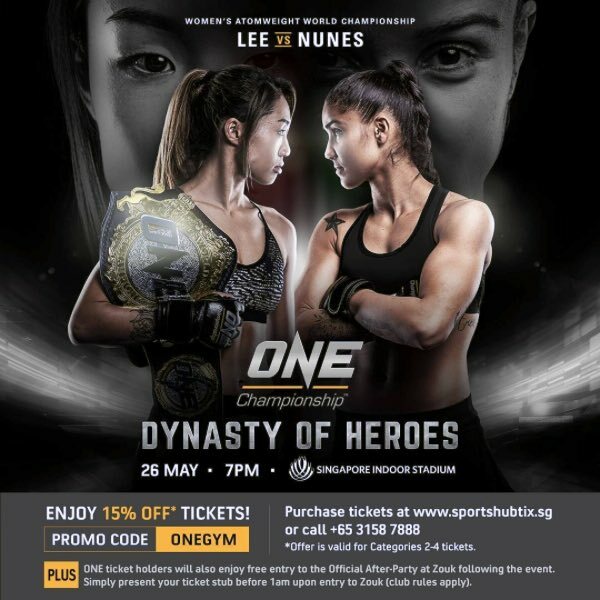 The Singapore Indoor Stadium will roar with excitement once again on 26 May, as ONE Championship puts on another night of world-class mixed martial arts action! Headlining the star-studded fight card is ONE Women’s Atomweight World Champion “Unstoppable” Angela Lee, who is making a quick turnaround following her first title defense. She takes on the challenger Istela Nunes, a two-time Muay Thai world champion. In the co-main event, one of MMA’s all-time greats defends his belt, with ONE Welterweight World Champion Ben “Funky” Askren facing undefeated Malaysian star Agilan “Alligator” Thani. What’s more, Singapore will be in for a special treat, as former ONE Lightweight World Champion and multiple-time grappling champion Shinya “Tobikan Judan” Aoki goes up against famed BJJ champion Garry “The Lion Killer” Tonon in a Grappling Super-Match. cheer for our local heroes such as Amir Khan and Tiffany Teo as they fight for glory alongside the biggest superstars in Asian MMA today.